Henry Kerruish, the son of Edmund Kerruish and Catherine (nee Quine), of Bowring Road, and later Ash Cottage, Ramsey. 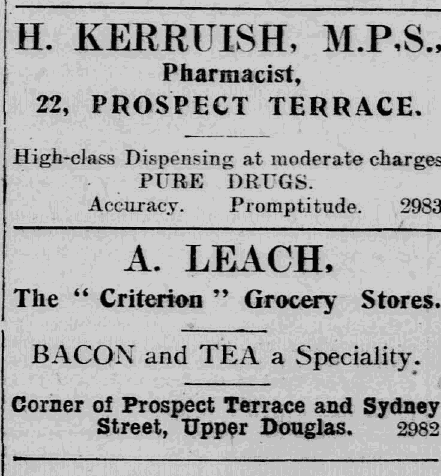 Kerruish worked for some years as an apprentice chemist in Ramsey, before studying at the Liverpool School of Chemistry, passing the examinations of the Pharmaceutical Society in 1895 (Isle of Man Times, 12 January 1895: 8). Following the completion of his studies he spent a couple of years working at a chemist at Waterloo, Liverpool, before returning to the Isle of Man to manage the Prospect Terrace branch of Brearey & Son, Chemist and Druggist. In 1902 he married Laura Muff, daughter of John Muff, formerly of Bradford and latterly hotelier in Douglas (Isle of Man Times, 31 May 1902: 7). Following the marriage they both moved into accommodation above the shop at 22 Prospect Terrace, Douglas. 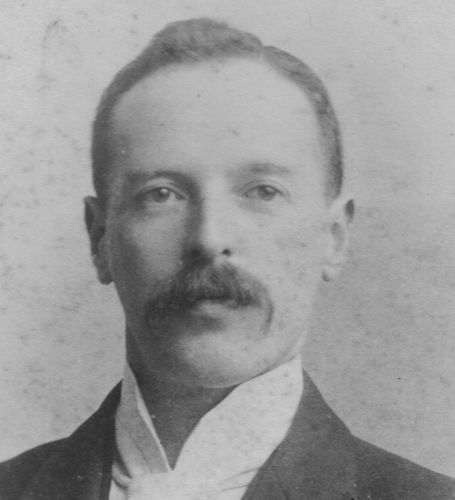 On the death of A W Brearey in 1904, Kerruish took control of the shop. In 1915, he had an attack of depression, and on one occasion threatened to throw himself from a window. On witness’ advice, he gave up his work for a time, and went to work at Knockaloe Detention Camp (Isle of Man Examiner, 19 August 1932: 4). Little evidence survives of Kerruish’s role, or experiences, within the camp. Almost certainly he would have worked alongside the camps other chemist, C H Cowley. At the inquest following his death Pantin reported that whilst working at Knockaloe showed that “he slowly recovered from his depression” (Mona's Herald, 23 August 1932: 7). The time spent with the internees at the camp seems to have been somewhat cathartic for him. Kerruish died in somewhat tragic circumstances at his own hand. The jury at his inquest concluded “that death was due to shock, consequent upon taking prussic acid, self-administered during temporary insanity” (Isle of Man Examiner, 19 August 1932: 4). Evidence from Dr Pantin showed that Kerruish had been subject to periodic bouts of depression throughout much of his life, although its cause was never diagnosed. Image of Henry Kerruish, ©John Kerruish. Advert for Kerruish’s Pharmacy, courtesy of the iMuseum, Manx National Heritage. Kerruish, J (nd). ‘Knockaloe during the First World War and the Train from Peel to the Camp’. Peel Heritage Trust Newsletter. (pp 12-16).